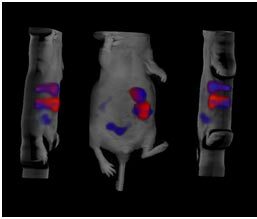 The UPMC Hillman Cancer Center Small Animal Optical Imaging service provides expertise and equipment that enable researchers to quickly, easily, and inexpensively answer technical questions related to in vivo events in small animal rodent models. The technical experts provide training for investigators using in vivo models to study cancer biology and therapy response including consultation, training, and support. FMT2500 fluorescence tomographic imaging device (VisEn, now part of Perkin Elmer), enabling the study of up to 4 fluorescent channels with different reporters. The optical imaging modality offers various reagents for imaging experiments, including a variety of luciferase or fluorescent protein-labeled tumor cell lines for in vivo modeling, as well as retroviral- and plasmid-based constructs (and protocols) to generate cell lines that stably express luciferase or fluorescent proteins. The IVIF also provides several transgenic mouse models (currently bred in-house on a C57/BL6 background) that universally expresses both luciferase and green fluorescent protein (GFP) from all tissues (including all hematopoietic lineages). The universal luciferase donor strains remain as sources for purification of immune cell subsets, tissues or organs ex vivo for transfer into naïve, unlabeled animals such that cell trafficking or tissue survival can be studied by bioluminescence imaging, and transferred cells studied post mortem by cellular GFP imaging or flow cytometry. Staff provides the expertise in isolating the labeled cells of interest from this transgenic line for use as donor cells in unlabeled animals.